Photo: Tania Victoria/Secretaría de Cultura CDMX/Flickr. 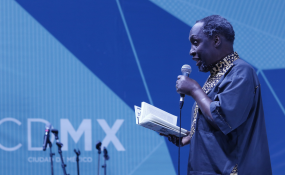 Acclaimed Kenyan Author Ngugi wa Thiong'o. Celebrated Kenyan writer Ngugi Thiong'o's remarkable novel, Matigari, is being adapted to film by Nollywood Director Kunle Afolayan. The revelation comes at an opportune time when African storytelling in film and dance has gained global prominence in recent years. 2018 has been an exciting time for African storytelling in film production, and in various other art forms. The global success of the Black Panther movie put into focus the urgency for Africans to take pride, and seize the leading role in telling their own realities rather than waiting for foreigners to create and curate such important conversations. African narratives, and experiences are in abundance and these realities have always been valid, but there has been a void in telling these stories, for both African and global audiences. Thankfully there is a shift. There has been a number of adaptation projects announced this year, which include Chimamanda Ngozi Adichie's novel Americanah and The Daily Show host Trevor Noah's bestselling autobiography Born a Crime: Stories from a Southern African Childhood. The latest revelation of an adaptation is Ngugi wa Thiong'o's 1987 novel Matigari, which is being made into film by Nollywood director Kunle Afolayan in a co-production with Kenyan, and South African filmmakers. The co-producers are yet to be disclosed. Afolayan revealed the news on the sidelines of the African Movie Academy Awards (AMAA) that took place in Kigali, Rwanda. "Ngugi is like the Wole Soyinka of Nigeria in Kenya and one of his books is going to be adapted into a film". "It's going to be South Africa-Kenya-Nigeria co-production and I'm representing Nigeria," Afolayan added. The novel is moral and political tale in which Matigari, the protagonist, a freedom fighter, emerges from the bush in the political dawn of post-independence Kenya. He searches for his family and a new future , but finds that not much has since changed. The book deals with various themes, which include oppression, and exploitation, inequality, and betrayal. What is commendable and encouraging is that Africans are continuing to take a keen interest in telling their stories using film and cinema but more still needs to change. There is a lack of domestic investment in the film industry and the infantilism of it elsewhere on the continent is evident. Recently, global streaming giant Netflix revealed that it is injecting an $8 billion original production budget into Nollywood the world's second largest film industry. While this is an immense win for Nollywood, the investment points to the lack of domestic investment in the film industry and the infantilism of it elsewhere on the continent. Although Africa has shown the biggest progression of internet users in recent years, suggestively increasing access to local content, many African countries do not have a booming film industry like Nollywood. Funding, distribution and profitability are still sore points, the persisting 30-year old colonial heritages of filmmaking, distribution and exhibition, western preferences by viewers and lack of domestic investment are the main causes of an infantile film industry in most African countries. Censorship has also played a key role in undermining films even after the bypass all other production obstacles.